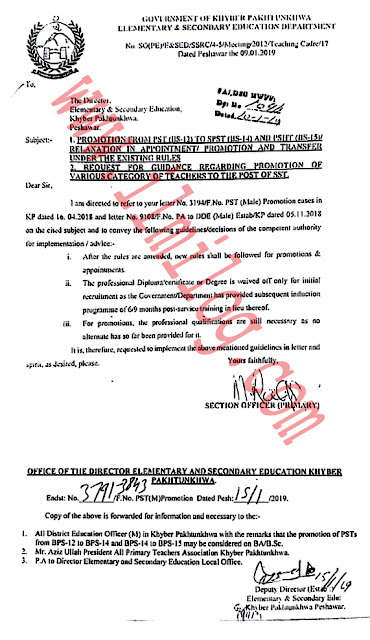 Notification dated Peshawar the 09.01.2019 regarding KPK Primary School Teacher & Other Promotion Rules 2019 E&SE Department by Elementary and Secondary education department Khyber Pakhtunkhwa. Promotion from PST BS-12 to SPST BS-14 and PSIIT BS-15 relaxation in appointment/ promotion and transfer under the exist1ng rules. • After the rules are amended, new rules shall be followed for promotions and appointments. • The professional Diploma /certificate or Degree is waived off only for initial recruitment as the government/Department has provided subsequent induction program of 6, 9 months post-service training in lieu thereof. • For promotions, the professional qualifications are still necessary as no alternate has so far been provided for it. It is, therefore, requested to implement the above-mentioned guidelines in letter and spirit as desired, please. OFFICE OF TIIE DIRECTOR ELEMENTARY AND SECONDARY EDUCATION Khyber Pakhtunkhwa. Copy of the above too- I. All-District Education Officer (M) In Khyber Pakhtunkhwa with the remarks that the promotion of PSTs from BPS-12 to BPS-14 and BPS-I4 to BPS-15 may be considered on BA/B.Sc. 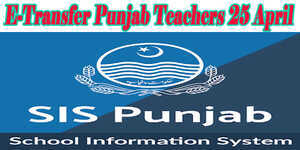 3 PA to Director Elementary and Secondary Education Local Office.